The 8 Best Bagel Shops in Iowa! Nothing quite starts your day off right like biting into a fresh bagel, and whether you slather yours with cream cheese or transform it into a breakfast sandwich, the state of Iowa will never leave you hanging when it comes to quality bagel shops. To find that authentic New York-style bagel or your next favorite breakfast entrée, be sure to check out these eight best bagel shops in Iowa. The Cabin Coffee Company started from humble beginnings and a simple idea of wanting a bagel company closer to the Clear Lake home of business owners Brad and Angie. The two entrepreneurs opened their first store in Clear Lake in 2002, and since then have spread across the Midwest to open multiple franchise locations with the same name. Don’t let the small chain fool you though, nothing has changed in their mentality of family-friendly and welcoming environments from their original bagel shops, including with it the freshest bagels you can find to start your morning. Open seven days a week in Clive, 5 Borough Bagels is a relatively new spot for New York authentic bagels, and is quickly proving to reign supreme when it comes to Iowa’s bagel scene. 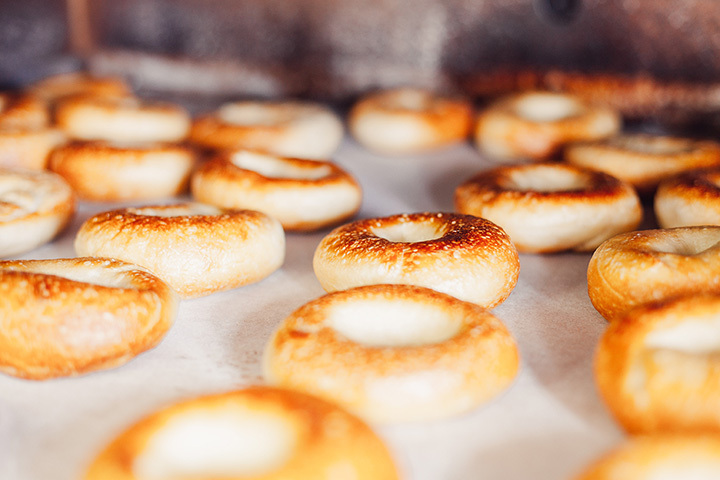 Baked fresh every morning, whether you coat your bagel with cream cheese or go for one of the prepared bagel sandwich options offered by 5 Borough Bagels, you’ll see for yourself why you don’t have to leave the Midwest to get a mouth-watering bagel. Smokey Row Coffee operates four different locations within the state of Iowa, including Des Moines, Oskaloosa, Pella and the original shop in Pleasantville. While all four locations add a little bit of a unique flavor to the Smokey Row Coffee brand, they all deliver on the toasted or prepared bagel you’re looking for. Choose your spread or opt for a tantalizing sandwich option like the chicken Caesar bagel, and whatever you do, know that within your first bite you’ll be asking for more. As the name applies, CJ’s Bagel Basket and Big Bowl Salad Company in Ankeny offers a lot more than just a bountiful bagel selection. While the salads are good and an often-healthy option to go for, what has really put CJ’s on the map is there wide selection of bagels available for in-store pickup and catering. With over 12 different varieties to choose from on a daily basis, plus enough cream cheese choices to really mix things up, if you’re looking for a great bagel, look no further than CJ’s Bagel Basket and Big Bowl Salad Company in Ankeny. While From the Ground coffee shop specializes in carefully brewed coffee drinks, it’s worth mentioning their fine selection of bagels and other eating options. Whether you go for a classic American bagel sandwich, or opt for cream cheese atop your toasted slices, perhaps even more than the coffee, it’s the warm and welcoming atmosphere that pairs nicely with whatever is your bagel of choice at From the Ground in Leon. With 15 locations in relatively proximity to the western shores of Lake Superior, Big Apple Bagels has a single Iowa store located in Dubuque near the Iowa River. If you ever happen to find yourself in that area, it’s well worth the time to stop into Big Apple Bagels and decide over the many different bagel options on the menu. From breakfast sandwiches that can’t be beat to single bagels in every variety, Big Apple Bagels mission is simple and easily obtained, to provide you with the best bagel options you can find anywhere else in the Midwest. Van Hemert’s Dutch Oven Bakery is a full-line, made-from-scratch bakery that explores its Dutch heritage while serving up specialty breads, bagels and baked items on a daily basis. The smells alone can guide you to the doors of this Dutch Oven Bakery in Ames, and while the bagels made each morning are always a safe bet for something delicious, don’t forget to try all the homemade goodies offered within your next visit to the iconic Van Hemert’s Dutch Oven Bakery. Serving the Iowa City area for over 20 years, the best time of day to visit the Cottage Bakery on Benton Street is at 6:30 in the morning when the doors first open. Not only will you get the first selection on all the bakery items cooked up that morning, but biting into a bagel (or any fresh-made pastry for that matter) is one of the best ways to start your day. Available for catering as well, see for yourself why this small bakery is a cemented staple within the Iowa City community.